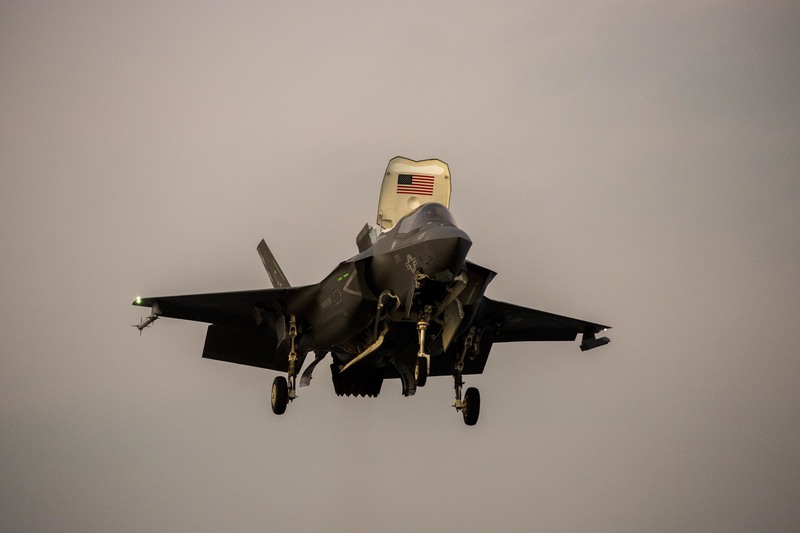 Marines and sailors with the Essex Amphibious Ready Group and 13th Marine Expeditionary Unit flowed off their ships and back home on Thursday, ending an eight-month deployment that included the first-ever combat strikes by the F-35B Joint Strike Fighter. Amphibious assault ship USS Essex (LHD-2) and amphibious transport dock USS Anchorage (LPD-23) were spotted off Camp Pendleton, Calif., Thursday morning. The Essex ARG/13th MEU also includes dock landing ship USS Rushmore (LSD-47). The U.S. Pacific Fleet put a media embargo on any announcement or reference of the 13th MEU’s return until after 3:30 p.m Thursday, local time, “due to operational security concerns,” a I Marine Expeditionary Force spokeswoman said. The three ships pulled into San Diego Naval Base on Friday morning, 3rd Fleet said in a news release. The deployment marked the first combat sorties by the F-35B multi-mission jet, flown by the Wake Island Avengers of Marine Fighter Attack Squadron (VMFA) 211 from Marine Corps Air Station Yuma, Ariz. Missions included support to ground forces in Iraq, Syria and Afghanistan. 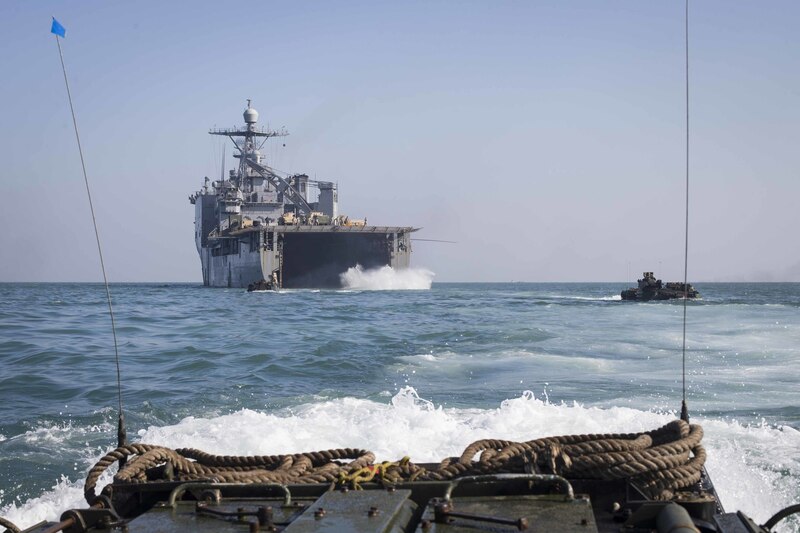 The amphibious force operated in three geographic regions during the deployment, mostly in the U.S. 7th Fleet and 5th Fleet – and Anchorage also traveled to the Mediterranean to support U.S. 6th Fleet operations and train with the Italian military. Marines assigned to Kilo Company, Battalion Landing Team 3/1, 13th Marine Expeditionary Unit (MEU), depart from the well deck of the Whidbey Island-class amphibious dock landing ship USS Rushmore (LSD 47), Nov. 29, 2018. US Marine Corps photo. The F-35B jets returned home to Yuma on Monday afternoon, according to 3rd Marine Aircraft Wing at MCAS Miramar, Calif.
Last week, the Essex ARG/MEU stopped in Hawaii, picking up friends and family for a “Tiger Cruise” back to California. 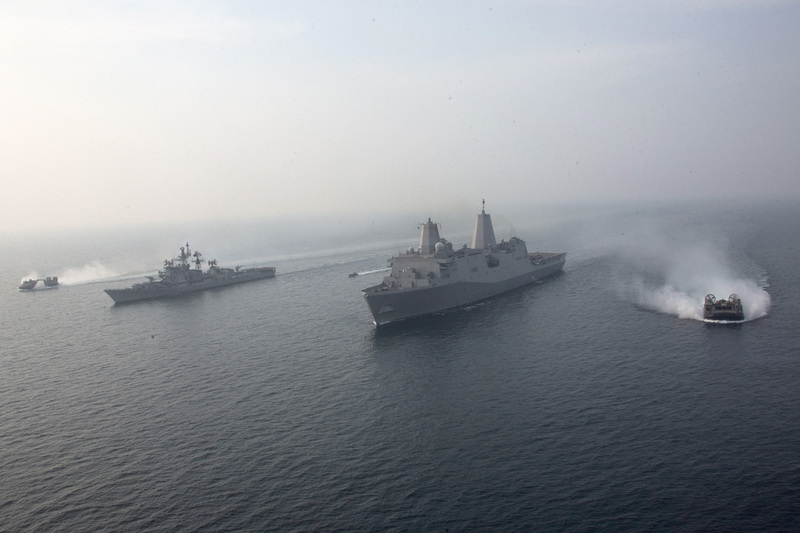 The San Antonio-class amphibious transport dock ship USS Anchorage (LPD 23), with the embarked 13th Marine Expeditionary Unit (MEU), participate in a cooperative deployment with the Indian navy destroyer INS Rajput (D 51) to test their ability to communicate and improve on maritime capabilities between partners, Dec. 26, 2018. US Marine Corps photo. Those missions included bilateral CARAT, or Cooperation Afloat Readiness and Training, exercises with Malaysian and Indonesian military forces, as well as a theater security cooperation exercise with the Indian Navy. Marines and sailors on Anchorage joined with Sri Lankan forces to build interoperability and support regional partnerships. The F-35B squadron is part of the 13th MEU’s air combat element led by Marine Medium Tiltrotor Squadron 166 (Reinforced). The 3rd Battalion, 1st Marines led the Battalion Landing Team 3/1 as the MEU’s ground combat element, and Combat Logistics Battalion 13 served as its logistics element. The Essex ARG includes includes the Blackjacks of Helicopter Sea Combat Squadron 21 and detachments from Assault Craft Unit 5, Naval Beach Group 1, Beachmaster Unit 1, Fleet Surgical Team 3 and Tactical Air Control Squadron 11. The following is the March 1, 2019 release from U.S. 3rd Fleet. SAN DIEGO (NNS) — Sailors and Marines of the Essex (LHD 2) Amphibious Ready Group (ARG) returned to their homeport of San Diego, following a successful deployment to the Indo-Pacific, Middle East, Mediterranean, and Horn of Africa regions, March 1. More than 4,500 sailors and Marines of the Essex ARG and embarked 13th Marine Expeditionary Unit (MEU) conducted maritime security operations and theater security cooperation efforts in support of regional security, stability, and the free flow of maritime commerce. During the ARG/MEU’s deployment, the ships conducted subject matter exchanges and important theater security cooperation exercises with regional partners in 5th, 6th and 7th fleets as well as participated in military operations. Essex is comprised of amphibious assault ship USS Essex (LHD 2), amphibious transport dock USS Anchorage (LPD 23), and amphibious dock landing ship USS Rushmore (LSD 47). Embarked commands include “Blackjacks” of Helicopter Sea Combat Squadron (HSC-21), Assault Craft Unit 5, Naval Beach Group 1, Beachmaster Unit 1, Fleet Surgical Team 3, and Tactical Air Control Squadron 11. 13th MEU is commanded by Col. Chandler Nelms and consists of the Command Element, the Aviation Combat Element comprised of Marine Medium Tiltrotor Squadron 166 (Reinforced), Marine Fighter Attack Squadron 211, the Ground Combat Element comprised of Battalion Landing Team 3/1 (Reinforced), and the Logistics Combat Element comprised of Combat Logistics Battalion 13. The end of this deployment is uniquely significant, as it was the inaugural combat deployment of the Marine Corps F-35B Lightning II. Throughout deployment, the ARG/MEU participated in a variety of exercises with multi-national partners throughout the Indo-Pacific, Mediterranean, and Middle East regions, which strengthened partnerships and increased combat readiness, amphibious and crisis-response capabilities, and communication between U.S. and partner nation forces. In the western Pacific, sailors and Marines worked with militaries during bilateral Cooperation Afloat Readiness and Training exercises with Malaysia and Indonesia. Simultaneously, sailors and Marines of the Anchorage worked with the military of Sri Lanka to bolster regional partnerships. In the Middle East, the team participated in exercises with a variety of partners during bilateral engagements such as Eastern Maverick 19 with Qatar and the Theater Amphibious Combat Rehearsal, which was conducted in Djibouti. As Rushmore and Essex conducted operations in the Middle East, Anchorage represented the ARG/MEU team as they operated in the Mediterranean Sea. The steadfast and formidable presence of Anchorage and the 13th MEU decisively advanced stability and security objectives in the region. Sailors and Marines of the ARG/MEU had the opportunity to visit several foreign ports during the duration of the deployment. Through these port visits, the crews were able to immerse themselves in diverse cultures and allow the local populace to interact with them in various activities such as tours and community relations projects. The ships visited ports in Singapore, Malaysia, Indonesia, Sri Lanka, Bahrain, Qatar, Oman, Italy, Spain, Thailand, India, and United Arab Emirates. The ARG/MEU also conducted 11 community relation projects in 6 countries with over 230 sailors and Marines participating.